This cheesy twice baked cauliflower is a low-carb, delicious alternative to twice baked potatoes and is the perfect side for your favorite low-carb meal. This cauliflower is called “twice baked” because it tastes amazingly similar to loaded or twice-baked potatoes. It is SO easy and SO delicious! I made it for the first time this weekend, and we all loved it. I’ve eaten it for leftovers twice, and it tastes wonderful reheated. Since we are trying to eat fewer carbs, I am experimenting with some recipes that cut carbs but don’t compromise on flavor. This recipe fits the bill and is definitely a keeper. I would serve this for company; it is that good. The recipe uses cruciferous cauliflower instead of potatoes and gets huge flavor and richness from three different cheeses. It is so rich and decadent that one of my daughters said, “Mom, this can’t be healthy.” She may be right if you are on a low-fat diet, as this is not low fat. But if cutting carbs, this is a must try side dish. Make ahead: This can be made up to the point of baking. Just cover the dish and refrigerate until ready for baking. Once done, this can be kept warm in the oven until serving. 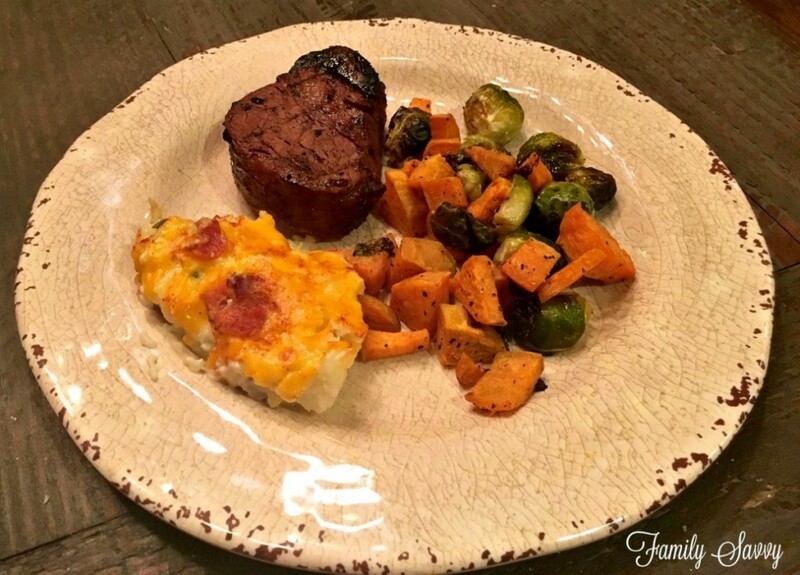 We enjoyed this dish with Kensington Club marinaded filet mignons and roasted Brussels sprouts and sweet potato medley. The meal was SO delicious that it was hard to believe it was low in carbs. If you try this, please let me hear how you like it. I am so crazy about this dish that it will be on our meal rotation for sure. As always, thanks so much for stopping by. Be blessed, and stay savvy! 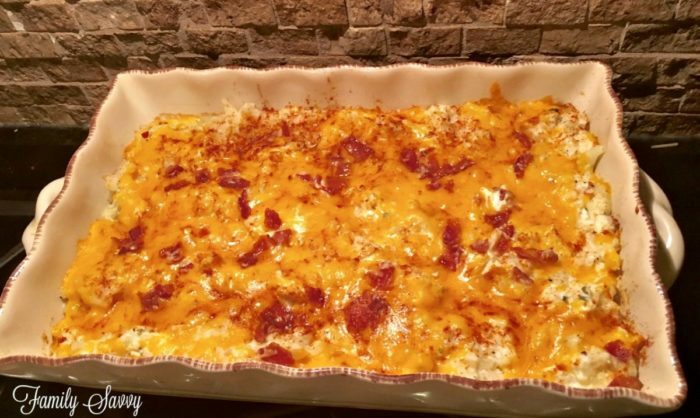 You'll never miss the potatoes in this cheesy, rich, decadent and low-carb casserole! Cut cauliflower off the core and into large pieces. Bring large pot of water and 2 TB salt to boil. When water boils, add cauliflower; cover pot and return to boil. Once water begins to boil again, set timer for 10 minutes. In 10 minutes, cauliflower should be firm tender; if so, remove and drain immediately. Sprinkle cauliflower with salt, pepper & garlic salt to taste. Place cauliflower in a medium bowl with butter, cream cheese, sour cream, and half of bacon. Using potato masher, break cauliflower pieces into small pieces similar to hash browns. Use spoon to mix ingredients well. Spread cauliflower mixture into glass baking dish sprayed with cooking spray. Top with shredded cheddar and remainder of crumbled bacon. Bake for 30 minutes or until cheese is melted and top is bubbly and golden. Hi Terri, so glad you liked the cauliflower!!!! I’ve never heard of Daddy Hinkles but will definitely look for it! Sounds great!! Thanks for sharing this!!! was delicious. Family loved it. I paired it with a filet Mignon steak also, but since I didn’t have time for marinate, I used Daddy Hinkles and pan seared the meat. Don’t know if you have it available where you are, but Daddy Hinkles is made in Texas. It is a duet: a wet seasoning bottle that you douce the meat with, then a dry powder that you sprinkle on. It is delicious on any meat or vegetable, especially with grilling. Thank you! Hi Joyce, thank you for commenting; you were rightly confused! I had two lines that didn’t belong in the recipe. Recipe is now corrected~thanks fo you:-) Be blessed!!! I was just reading the steps for preparing the Cheesy Twice Baked Cauliflower and was puzzled by steps 14 & 15 Am I just confused or are they incorrect.